Photograph courtesy Bill Wright 'Barkingbill' A wonderful view of D5159 leaving Tees Yard on April 17th 1967. The orange flourescent warning panel, only carried on this locomotive is clearly visible. Of equal interest is the fascinating selection of goods wagons being pulled along by D5159, and no doubt filled with many chemical products from the industrial complexes on Teeside. The modified warning panel livery is believed to have been carried until D5159 visited Derby Works during the spring of 1968. The eighteen year eleven month career of D5159/25009 was split between Eastern & Scottish Region depot allocations. Green to blue livery: May 1968. Time between last Classified repair and withdrawal: 31 months. August 1971 to Holbeck (55A). January 1972 to Eastfield (65A). 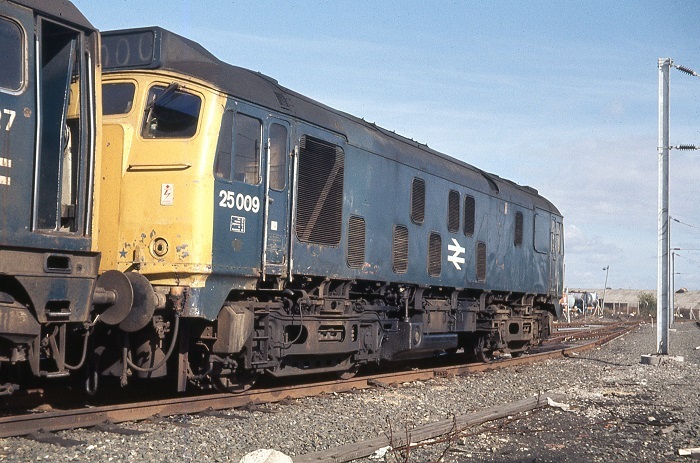 25009 was the 34th Class 25 to be withdrawn, one of four retired during July 1980. After withdrawal 25009 was moved to Glasgow Works and broken up there by October 1980. 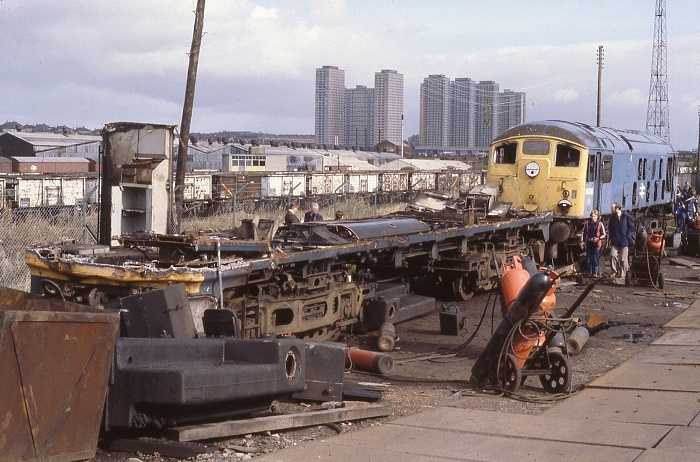 Photograph courtesy Bill Wright 'Barkingbill' 25009 has come to the end of the road in the scrapping area at Glasgow Works, seen on October 4th 1980. Little time now remains for 25009, next in line is 24006 having recently been dragged over from Eastfield depot. Noted Darlington Works February 1962. Noted Darlington Works September 1962. Noted Darlington Works Novembner & December 1963. 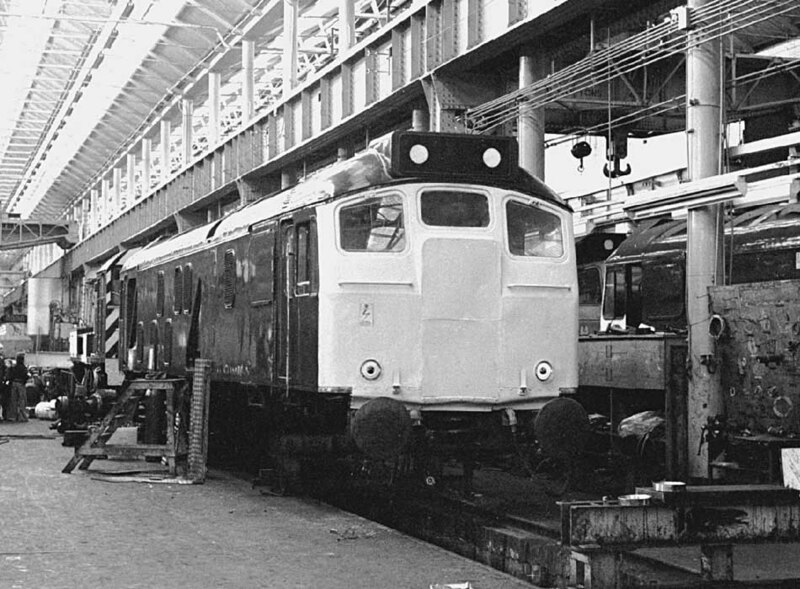 Noted Darlington Works December 1964. 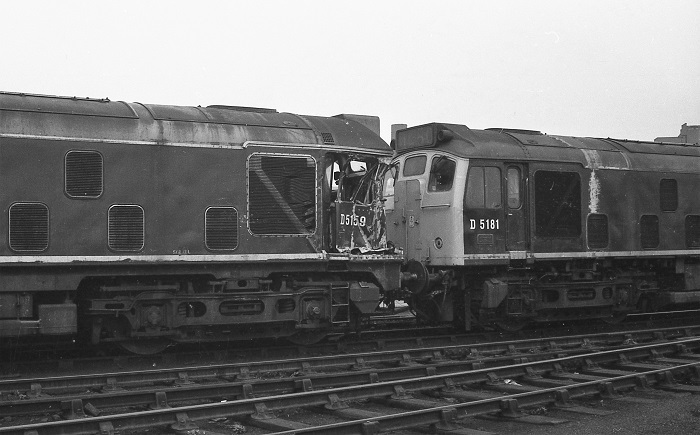 Noted Derby Works April & May 1968 (collision damage). Noted Glasgow Works October & November 1977 (Intermediate repair?). 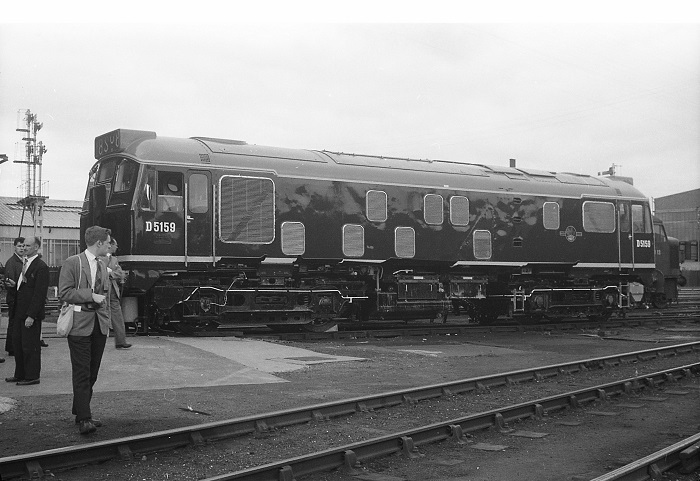 The frames for D5159 were laid down at Darlington Workshops during the spring of 1961, part of an order for twenty five Type 2's, the first batch to be fitted with the uprated 1,250hp Sulzer 6LDA28B engine. D5159 was released from Darlington during August, like the rest of this order it was delivered to Thornaby (51L). Photograph collection of webmaster. D5159 at Darlington Works on July 8th 1961, almost ready to be released to traffic. D5159 was noted in ex-works condition during March (or May), retaining the yellow warning panel no higher than the cab front handrails. Sometime during 1966 two of Thornaby’s Type 2s were trialled with fluorescent front panels - so treated with red paint was D5159. This machine was noted in this garb on September 12th handling the heavy ICI Haverton Hill block ammonia train, comprised of two WR brake vans and thirty six tank wagons. D5159 was at Derby Works during April & May for the repair of collision damage. Photograph collection of webmaster. D5159 & D5181 at Derby Works during April 1968. Condition July: blue/yellow livery, gangway doors present, shortened fuel tank - circular gauge fitted, no water tank, blanking plates fitted, hand/footholds present, ridge sided sandboxes, two-rung bogie mounted footsteps, modified headcode box No.1 cab, has wings, BR emblems on each cabside, two numbers on each bodyside, no 'D' prefixes. Amongst a quantity of Class 25/0s transferred to Leeds (55A) during the latter half of 1971 including 5159 in August. 5159 was transferred to Eastfield (65A) in January. 5159 was noted at Glasgow Works during August. Glasgow Works received 5159 for repair during February. After over two years at Eastfield 25009 was transferred to Haymarket in April. At the end of the summer timetable 25009 was transferred to Tinsley during October. On July 7th the 00.05 Glasgow Central - Bristol Temple Meads was worked from Hartford Junction to Crewe by 25009 & 25140, dragging 81012 via Sandbach. During the summer a reshuffling of motive power took place to deal with the mass withdrawals of the LMR & ScR Class 24's, part of these transfers included sending 25005-25014 from Tinsley to Eastfield. during August. Condition July: blue/yellow livery, gangway doors sheeted over, shortened fuel tank - circular gauge fitted, no water tank, blanking plates fitted, hand/footholds plated over, ridge sided sandboxes, two-rung bogie mounted footsteps, modified headcode box No.1 cab, has wings. 25009 was one of several Class 25/0's stored during February, it would be reinstated to Eastfield during June. On July 27th 25009 & 24116 worked the 12.45 Aberdeen - Edinburgh. 25009 was stabled at Motherwell on the afternoon of September 10th. 25009 was noted at Glasgow Works during November. In this view 25009 reveals its unusual headcode housing, not the regular rectangular box but one with 'wings' that do not contain the airhorns. 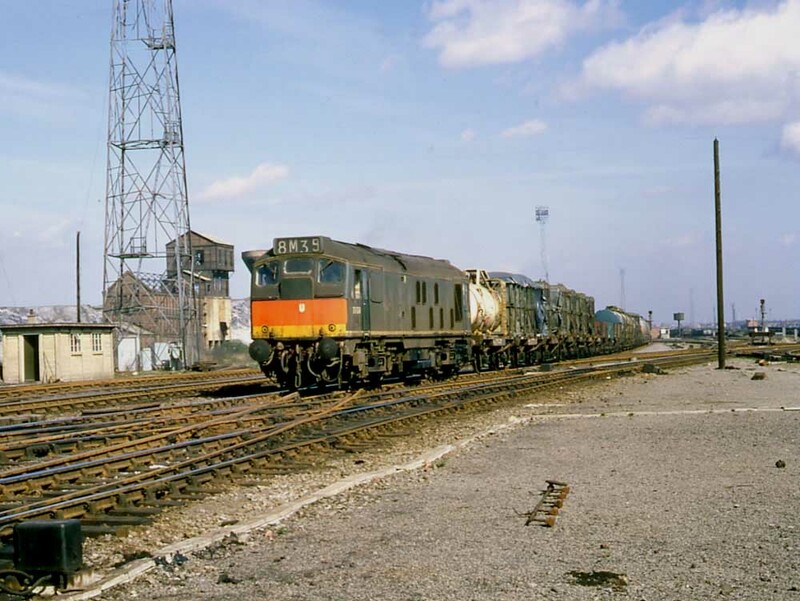 Photograph courtesy Tony Sayer Glasgow workshops are host to 25009 on October 29th 1977. 25009 was noted at Whifflet Junction on a snowy February 17th with a short engineers train, mostly loaded with sleepers. The 07.00 Mallaig - Glasgow Queen Street was worked throughout by 25009 on September 4th. The next day (5th) 25009 worked the 08.44 Glasgow Queen Street - Dundee. 25009 was noted shunting in Elgin yard on February 8th and was later noted heading towards Aberdeen with 47120 leading 25009 and its freight train. A short passenger working for 25009 on August 30th was the 04.20 Mossend Yard - Glasgow Queen Street forward from Cowlairs Junction, being the Glasgow portion off the 1S07 Euston - Inverness. 25009 was transferred to Haymarket during January. 25009 was noted at Haymarket depot on the morning of February 18th. 25009 was withdrawn on July 7th 1980. Condition final: blue/yellow livery, gangway doors sheeted over, shortened fuel tank - circular gauge fitted, no water tank, blanking plates fitted, hand/footholds plated over, straight sided sandboxes, three-rung bogie mounted footsteps, modified headcode box No.1 cab, has wings. The distinctive headcode box at the No.1 end. Page added August 14th 2004. Page updated February 17th 2019.